My hopes for keeping peace lasted until 275AD. Pathetic, isn't it? Alex was marching with two axemen (str 5) towards Washington, and two war elephants (str 8!) appeared near New York, while all I had were four archers and three warriors spread around my empire. To make matters worse, I had just discovered iron working and my workers were given orders to mine and connect the iron only right now, so it would take some time before I could build something better than archers or chariots. Adding in my inexperience with combat in this game, this could get really interesting! Washington had finished constructing the Parthenon this turn, so at least here the timing was good. Both Washington and New York were ordered to construct walls, which would boost my weak city defenders by 25%. I also emptied my back-line cities and moved all units I had into the threatened cities to hold out until stronger reinforcements would be ready! This kind of mess was well-known to me, though. 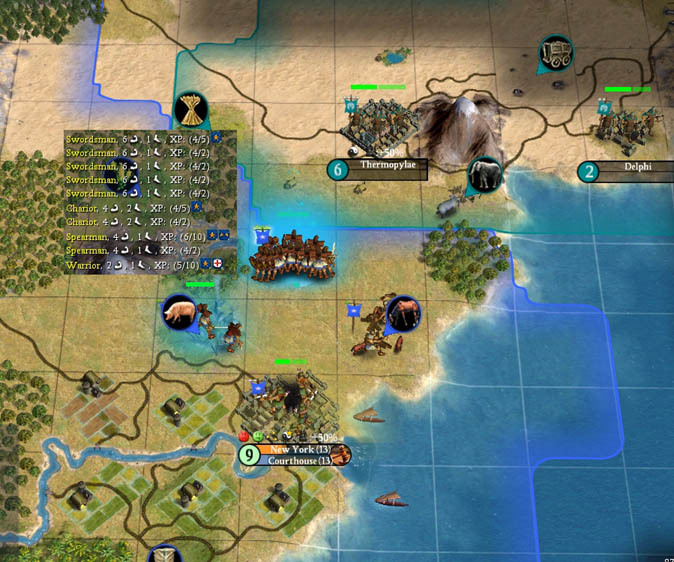 My style of playing Civ 3 had thrown me into these situations quite often: I tend to keep only a very small army in times of peace, relying on my abilities to switch to war-time mode quickly if war is declared upon me. My few defenders from all over the empire would then rush to the front to keep the attackers at bay, until my strong core would have produced enough up-to-date units to go into offense myself. I could do this because I knew the AI, the units and the combat engine very well; however, I was curious to see if I would be able to do the same here with this game as well. While my workers were frantically connecting the iron, the axemen pillaged a camp, and the elephants moved near New York. Next turn, walls were up and this seemed to prevent Greece from attacking my cities directly; instead, his units continued to pillage my lands, which was bad enough. I had a chariot constructed now, gave it the flanking promotion for a greater chance of retreating from combat, and rode a sortie against the axemen. Because retreating only works whan attacking, this was the sensible thing to do: I had the chance of killing or at least wounding one of the axemen without losing my unit. Had I waited until the axemen attacked, my chariot would have died without the chance of retreating from combat. Unfortunately, my chariot didn't retreat and died, but the axemen was wounded and moved away to heal, giving me some much needed room for breathing. Next up was a move on part of the AI: While the wounded axemen retreated, the other axemen attacked Washington (which had a warrior, a fortified archer, and the wounded chariot in it) and died against the archer. Why he hadn't waited for at least a second unit to kill off any wounded units of mine is beyond me. The same happened at New York: One elephant attacked and died (lucky me! ), the other stood still. The really silly part is that next turn, the other elephant attacked anyway, killing an archer of mine. 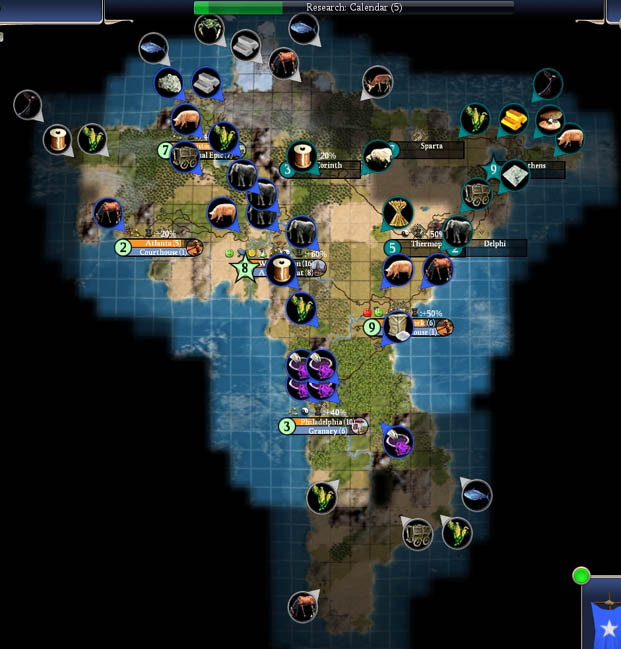 More AI silliness ensued during the next turns. I had a spearmen defending New York now, and one by one, three war elephants came and impaled themselves against the spear. That was actually a bit depressing, seeing how the AI failed to gather his units and attacked a fortified spear in a walled city with a single mounted unit instead (not counting the fact that there were more units in NY as well). I hope that this kind of behavior will improve on higher levels of difficulty! My iron came online, and I started to construct several swordmen. I lost another chariot and an archer during the following turn, but was secure now thanks to the swordmen, and indeed was able to assemble a nice stack to advance on Thermopylae myself. He had no catapults, though. He was willing to talk now, but wanted New York as a price for peace. Yeah, sure, whatever. Looks like I had to do some damage to him to bring him to senses. Alex had a phalanx, a swordman, and two longbowmen in Thermopylae, which was more than my force could possibly handle without artillery support. But I wanted to see some action, so I gave my swordmen the city raider promotion, and attacked! I lost two swordmen, but managed to take out one longbow, one swordman, and wounded the other longbow. And lo and behold, now Alex agreed to a straight peace treaty, seeing that I had two more swordmen coming as reinforcements! 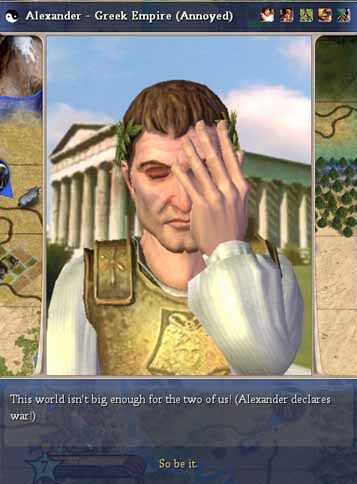 Herodotus published a list of the largest civs, and I'm listed as number one! That's nice. Alex is listed as last... 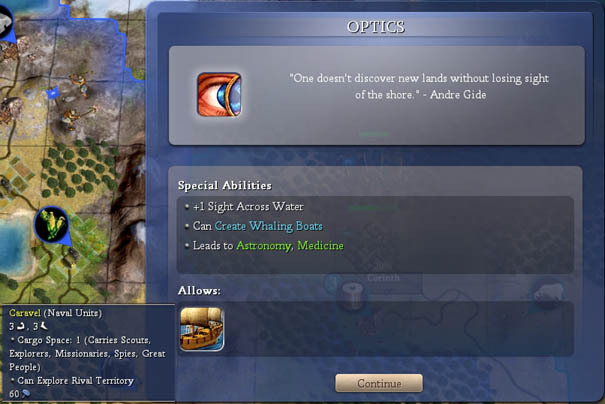 In 800AD, I finally reached my mid-term goal of researching optics, allowing me to build caravels to explore the oceans and to make more contacts, hopefully giving me opportunities for some trading!